The two large silos facilities are owned by Colonial Oil’s subsidiary, Georgia Kaolin Industries. Kaolin is a white Georgia Clay (often called, “white gold”), found predominately in 13 counties of Georgia along the fault line which traverses the middle of the state. Sandersville is home to the major mining and processing efforts. Kaolin (aluminum silicate) is used in the manufacture of rubber goods, plastics, medicine (Kaopectate), toothpaste, insulation, porcelain, and paints. But about 70% of Georgia’s kaolin goes to finish paper. This gives it the glossy look in magazines and enhances the color of inks. The mined kaolin is dug out of the earth, sent up to 16 miles through a pipeline as a slurry, and then pummeled, mixed and purified. The finished product is shipped dry or as a slurry in Sandersville Railroad tank cars. The whole process requires a good bit of precision, since the final product contains particles smaller than the size of particles of fog. That is because the machines that coat paper move at such high speeds that the tiniest impurity, like, a grain of sand, can cause a five-mile streak before the equipment can be stopped. 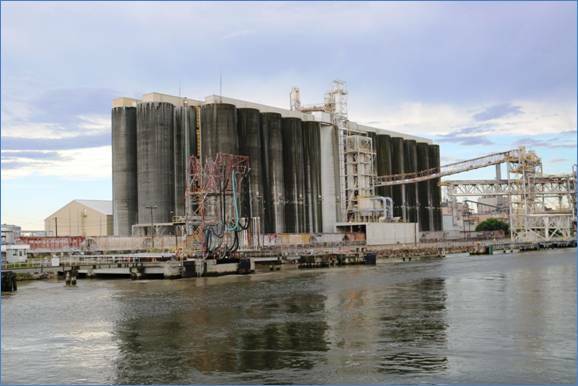 In addition to the two silos, there is a large dock and warehouse, recessed in a well between the northern silos and GAF. This is where bagged kaolin is loaded.